If you have questions about ordering a Dillon's, or you want to place an order by telephone, please call us at (804) 285-2969, or email us. All masks are painted with clear coat over your choice of base color. The price also includes a black or white cage. We will immediately begin to produce your mask upon receipt of your face mold and deposit check (see Payment Methods). Once we begin, it takes approximately 5-8 weeks to complete a mask. Once completed, you will be notified of the amount due and then the mask will be shipped COD. Please note, posted shipping rates do not include any duties and taxes imposed by international authorities. All prices are in U.S. dollars. 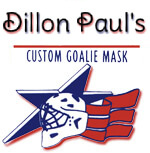 We will begin to produce your mask upon receipt of mold and deposit ($375.00), which should be in the form of a check or money order made payable to "Dillon's Custom Goalie Mask." Personal checks must clear before work can begin. When mask is complete, you will be notified of the amount due and when it will be shipped. The mask will be shipped COD. IMPORTANT: When ordering a mask, please specify preferred chin length and distance of cage from nose.